What do action sports have to do with hot dogs? The pun practically writes itself. When our long-term BallPark partners needed someone to activate a sponsorship of the Dew Tour, we geared up for the fun. Dudes. What do they care about? You never really know—maybe you get a shrug and a mumble. Or a full-on grunt. But as the Ultimate Guy Food, BallPark has something to offer them: Food. Delicious, hot food. From 2009–2011, at every tour stop, we created a uniquely branded experience in Festival Village. 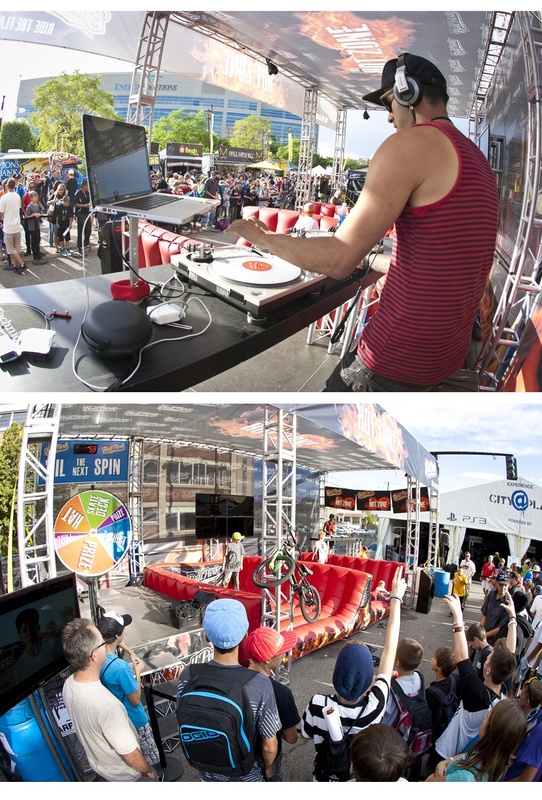 Our on-site activation included a tent and stage built expressly to engage attendees with branded action sports-oriented activities. And we evolved it each summer. 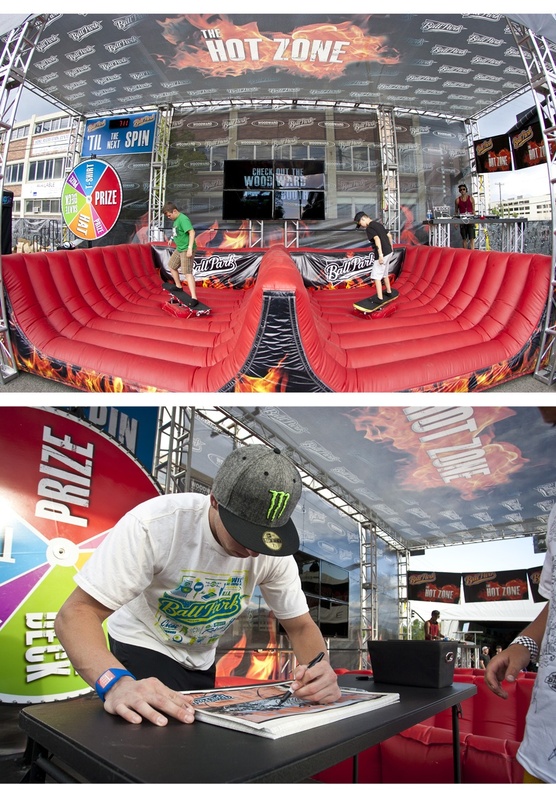 For 2011, we designed a fully branded “Hot Zone”—including a 40’ x 40’ stage featuring a video wall, DJ/emcee, prize wheel and dual mechanical “bucking” skateboards to draw traffic into BallPark’s booth. We produced a branded video to enhance the experience and communicate event activities, while brand ambassadors interacted with attendees and distributed branded premiums. Our DJ emcee spun tunes and hyped the crowd between occasional visits from BMX star Mike Spinner, who signed autograph and hosted VIP experiences to watch a competition final with him in each city. 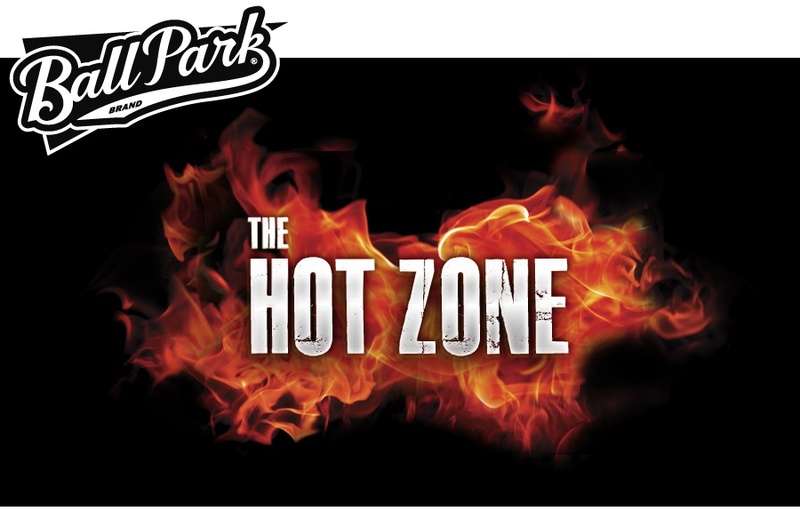 In 2010, approximately 2,250 fans met Mike Spinner in BallPark’s “Hot Zone” booth in Festival Village. The DJ/emcee awarded over 400 prizes ranging from Camp Woodward Scholarships to Pro Edition Hyper Bikes to Mike Spinner T-shirts. We distributed a total of 162,000 branded premiums and we spotted “Hot Zone” drawstring bags at the following 2010-2011 Winter Dew Tour, even though BallPark wasn’t a sponsor.